We are excited to share with you our latest video “Street Dog” featuring some special guest stars. At the end of July editor/videographer Kit Larson shot some more action here at Mad Maggies Central. He then went about editing his footage and the other material we have so far. He did a fantastic job! The audio is from our live performance at Lagunitas Beer Sanctuary on March 17, 2013 recorded by Zach Lindenbusch. B Fernandez art directed and generally kept us all on our toes. 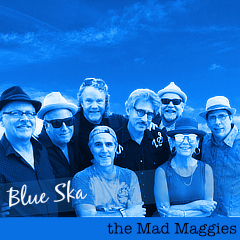 the Mad Maggies – Street Dog from the Mad Maggies on Vimeo. B Fernandez, dogs, Kit Larson, Lagunitas Brewing Co., Street Dog, video. When the Naked Ladies* Come Out It’s Time to Squeeze in the Park!